Ron's third day off was yesterday and we hadn't really done anything so we decided to get some activity in before he went back to work. We started out with a 45 minute walk around town to enjoy the sun and stretch our legs. After that we got on our bikes and went for a 45 minute ride and stopped at the BC fruit truck down town and picked up some peaches, corn and cherries. It seemed like such a nice day that we decided to go for a motorcycle ride for our afternoon tea. I grabbed my camera to take pictures of the colourful fields along the way. The sun on the canola made the fields almost fluorescent. As we drove west the clouds started to darken and so we turned north and enjoyed our tea in Olds. As we began our way back home I became almost as interested in the clouds as the fields. They were hanging so low and although they seemed light and fluffy over us we started to feel like the dark ones were moving in on us. One thing about being on the prairies is that you can see the storm coming and almost get around it. We are definitely not storm chasers...we are runners! As we were heading east the skies grew darker and darker so Ron turned south to try and make it home before the storm caught us. We wondered for awhile if we would beat it but soon we were on the road towards home and we could see the Three Hills in the distance. 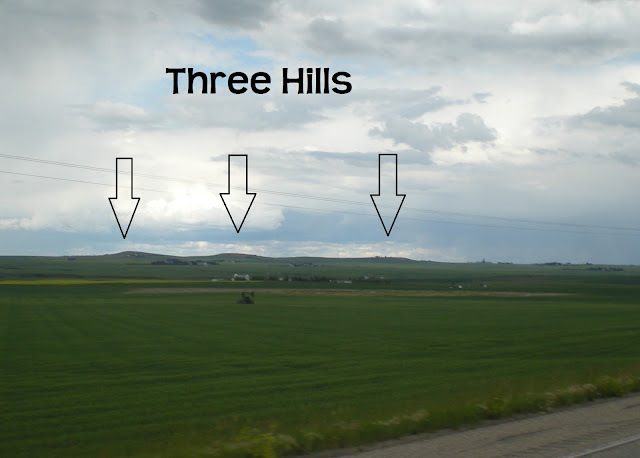 Yup, that's the three hills of Three Hills. We made it home just before the clouds opened up and let out the rain that they had been holding. This time we missed it!